Do you like traveling? Looking forward to enjoying your trip without worrying about the tedious planning aspect? 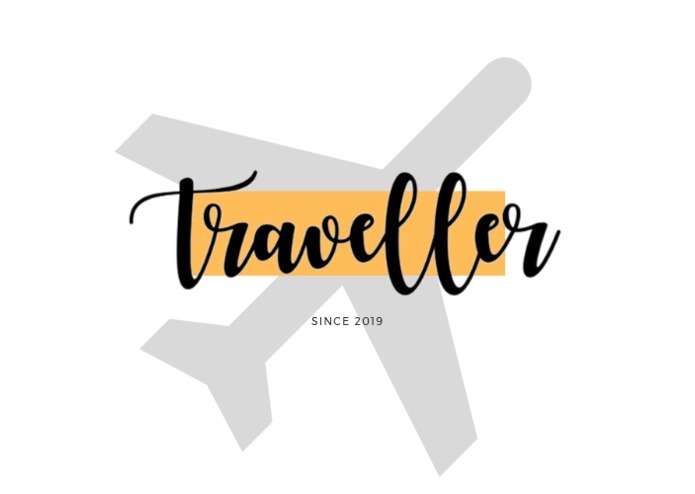 With Traveller, now you can! As young, economical college students, we want to make every trip worthwhile, and planning as stress-free as possible. According to Expedia, however, planning for a trip can be stressful and tedious: an average American visits 38 websites to research about the destination prior to attending their trip. 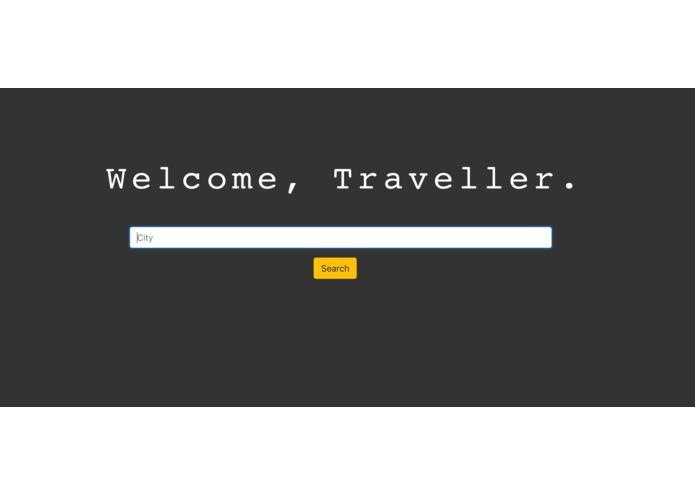 As a result, we were inspired to create Traveller, a web application that enables users to plan their itinerary all in one place. Instead of researching the desired destinations and logistics through many tabs, we provide one central website that lets users plan their ideal trip. Overall, Traveller will take care of all aspects of the trip, allowing users to truly enjoy their stress-free trip. 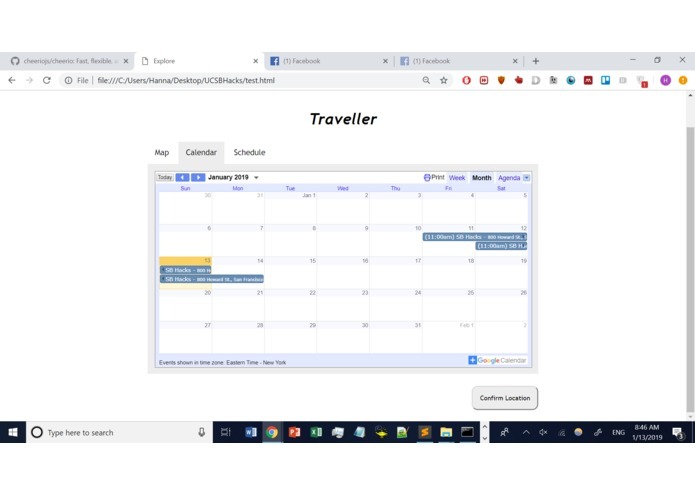 Traveller allows users to not only search and learn about possible destinations for their trips, but also build and customize their travel itinerary. 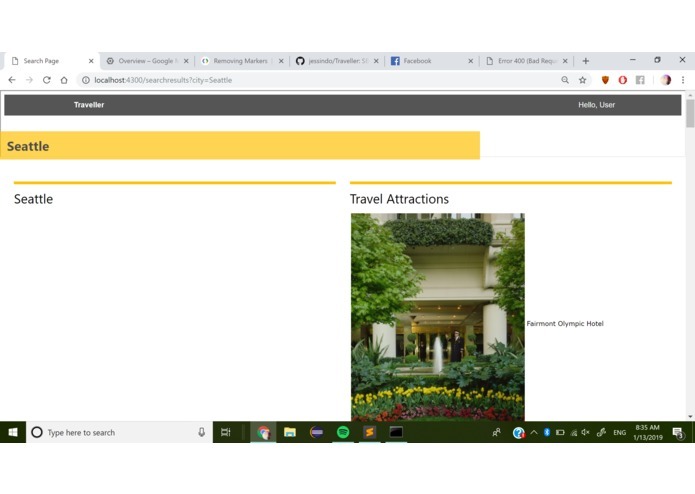 We have made travel-related searches much easier and efficient by combining descriptions of the location, attractions at the destination, and a map to enable users to visualize the location. 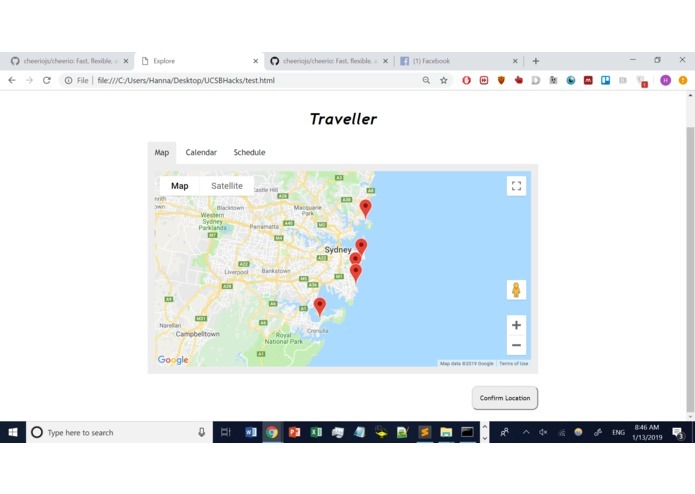 Through the use of many of the Google Cloud Platform applications -- Google Maps Platform, Calendar API, and Places API -- we were able to embed maps and calendars to aid users in their travel planning process. We used HTML, CSS, and ejs to build the front-end of the application, and we used Node.js and Express.js to build the backend. As a team that consists of two freshmen, one sophomore, and one junior, we have limited exposure to web development and learned many frameworks from scratch during this hackathon such as Node.js and ejs. We learned how to implement the various features of the Google Cloud Platform. We especially found it challenging to integrate everything that we have learned into a single project. We learned many frameworks from scratch in the limited amount of time and through reading documentation, explaining the things we learned to each other in a more abstract way, and seeking help, we understood every line of code we wrote and know how to implement the knowledge and skills we have gained through this hackathon in future hackathons and projects. We were also proud that we have a minimum viable product that seamlessly combines the redirection between one page to another. Overall, we have managed to achieve most of the features we wanted to implement. In the near future, we hope to implement user authentication to save the itinerary progress of each user. We are also eager to learn how to implement Twilio onto our application to send notifications of the events on the itinerary.